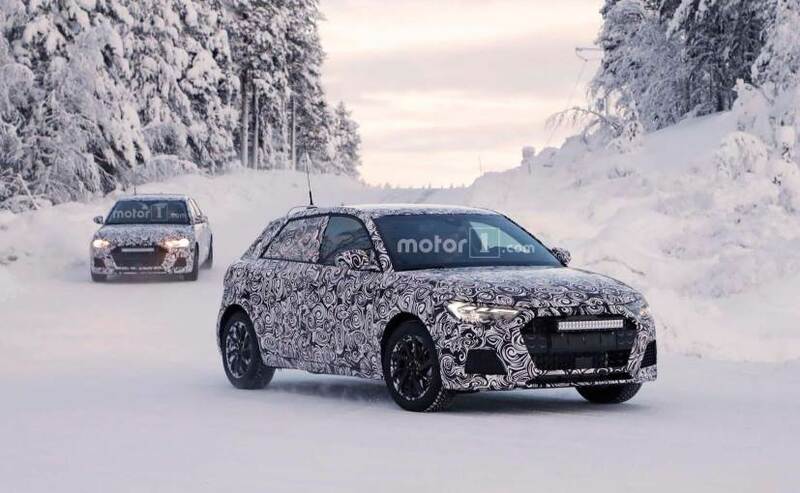 A couple of test mule of the next-gen Audi A1 hatchback was recently spotted while undergoing winter testing in some extremely cold environment. Slated to be unveiled later this year, possibly at the Frankfurt Motor Show or the Paris Motor Show, the second-generation Audi A1 is expected to come with a host of design and cosmetic changes along with new engine options. The heavy camouflage indicates that is still under development, but the production-ready headlamps, grille and taillamps say not for long. The test mules of the new-gen Audi A1 were seen with aggressive snow tyres and LED bar lights fitted to the grille, which makes sense considering the severity of the terrain. The prototype models are also seen with an antenna placed on the roof, possibly a part of some testing equipment. As for the production-ready parts, the car is seen with a pair of sleeker headlamps, Audi’s signature single-frame grille, large air intakes on both ends, and sleek central airdam. There is not much to comment on the styling courtesy of the heavy camouflage, but we do see a new set of alloy wheels and ORVMs on the sides. At the rear, the car appears to get new sharper-looking LED taillamps, a rear windshield wiper and a small roof-mounted spoiler. The new-gen Audi A1 is built on a modified version of the MQB platform, which currently underpins the new-gen Volkswagen Polo as well, which has also allowed it to grow in dimension and offer a slightly bigger cabin. As for the cabin, it’s expected to be loaded with Audi’s latest technology, including the 12.3-inch digital instrument cluster, along with premium level interior and comfortable upholstery. Engine options are still unknown, but the new-gen Audi A1 is expected to come with a new 1.0-liter turbocharged three-cylinder engine and a 1.5-liter four-cylinder motor, while a plug-in hybrid is also said to be under works. While Audi doesn’t offer the A1 in India, the car is still one of the company’s volume products, globally. Having said that, we would definitely like to see the car find its way to our Indian shores, and take on the likes of the Mercedes-Benz A-Class, MINI Cooper, and the Volvo V40.